Bill of Materials is an important part of Production Planning and is often needed by organizations to communicate with their partners or even among other manufacturing plants. It is critical to work on the live data in a secure environment, especially when multiple stakeholders are involved. Winshuttle Query provides users an ability to have the up-to-date bill of materials information available at any point in time in familiar Microsoft Excel and Access formats. You can create your own templates to add in filter criteria to lookup specific BOM categories (e.g. Engineering, Sales, Production) or specific item categories (e.g. Stock/Non Stock). If you need to modify BOMs due to a price update or configuration changes, you can make changes to the downloaded information in Excel/Access and use Winshuttle Transaction to upload the updated information to SAP without the intervention of your technical department. 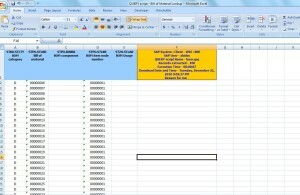 Can I apply transformation formulas in Query to download data in custom formats? Yes, Winshuttle Query allows you to add formulas in the mapper in a familiar MS Excel format. You can thus transform your data before downloading it. How can I make sure that employees cannot view data for a plant that they are not authorized to by plugging it as criteria in Winshuttle QUERY template? Winshuttle Query respects table as well as organizational level security. To this effect, a user will not be able to view BOM information for the plant for which they are assigned. Can Transaction enable use of conditions to upload selective data based on type of item/BOM category? Yes, you can create conditional logic in Transaction’s mapper based on type of item or any other condition to upload fields to SAP.